So what is the lifetime risk of a fatal cancer without CT scans in the mix? The answer is 400 out of every 2000 people will die of cancer. 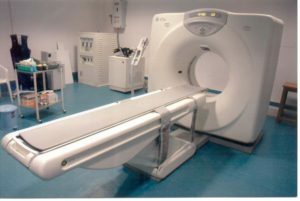 The US FDA says that one CT scan raises your lifetime risk slightly, from 400 to 401 fatal cancers per 2000 people. As you can see, the increased risk with one CT scan is very small. What many people don’t know is that the younger you are, the more dangerous radiation exposure is, with in utero and early childhood being the most vulnerable periods. Likewise, young adults are more sensitive than elders. After 50, the risk decreases precipitously. One of the few physical perks of aging, I guess. At your age (the patient was in his/her 70’s), the risk is low, although no one can say exactly how low. But because you already have a cancer, your doctor believes the benefit of keeping close tabs on what’s going on is worth the small risk of a CT scan causing a future problem. On the upside, research suggests there may be a slight hormetic effect (as in “what doesn’t kill me makes me stronger” ) to radiation exposure; small doses may improve your resistance to future radiation damage. If that research pans out, CT scans may become a health-promoting tool. For now, however, it’s probably prudent to undergo a CT scan only if you have a serious health condition best monitored by CT.
Reference: US Food & Drug Administration accessed 2017: What are the Radiation Risks from CT? Previous Previous post: Should you be drinking more coffee?